Six and a half billion Homo sapiens are now learning the futility of their ways of existence, just as one day some fish learned the futility of their gills on dry land. If those fish had sought to improve their aquatic science, invent new fins and new philosophies, they would have been mistaken. The question is whether we will find the WAY, not to improve human suffocation, but to be and live in another way on earth. Is there in this human body a spring, a lever which will enable us to change our terrestrial conditions, just as three million years ago a first mental vibration prepared Einstein and the Boeing 747? What vibration? Where, in the body? Could it be that life's raw material, the cell, conceals a power of consciousness or a "vibratory mode" which would make obsolete all our cerebral means and our dead-end devices? 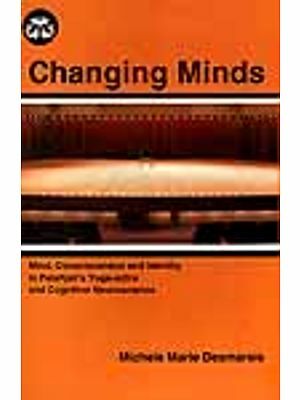 A Mind of the Cells which will open up to us new sources of energy, new means of communication, a new power to handle Matter. A new biology and a new consciousness which will enable us to meet the challenge of a species on its way to self-destruction. Such is Sri Aurobindo's and Mother's incredible discovery in the cells of the body, at a time when the earth is asphyxiating. For "salvation is physical" said she, who at the age of eighty, dared to knock at the body's last door, and who made the most tremendous discovery since Darwin. In 1953, at thirty, Satprem returned to India for good to be near Her who was in search of the secret of the passage to the "next species"-Mother, whose confidant and witness he became for some twenty years. His first essay was entitled Sri Aurobindo or the Adventure of Consciousness and was followed a few years later by On the Way to Super manhood. At the age of fifty, he edited and published the fabulous logbook of Mother's exploration, Mother's Agenda, in 13 volumes, while at the same time writing a trilogy-The Divine Materialism, The New Species, The Mutation of Death-followed by an essay, The Mind of the Cells. 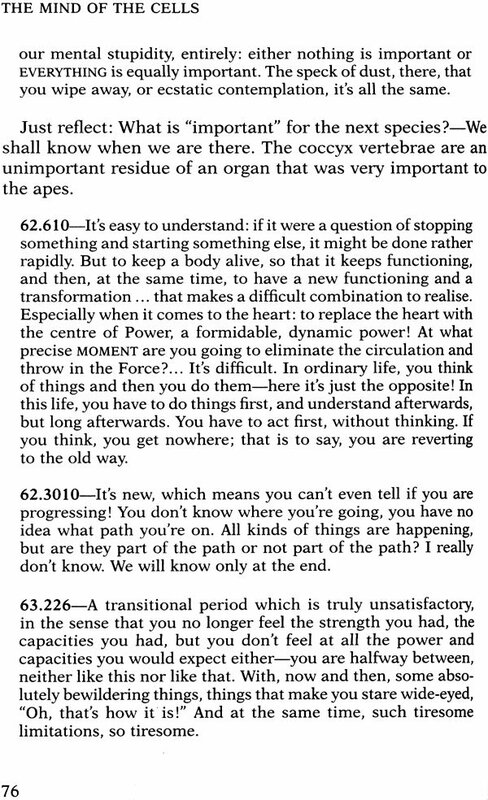 In 1982, with his companion Sujata, Satprem withdrew completely to embark on the last adventure: the search for the "great passage" in the evolution beyond Man. 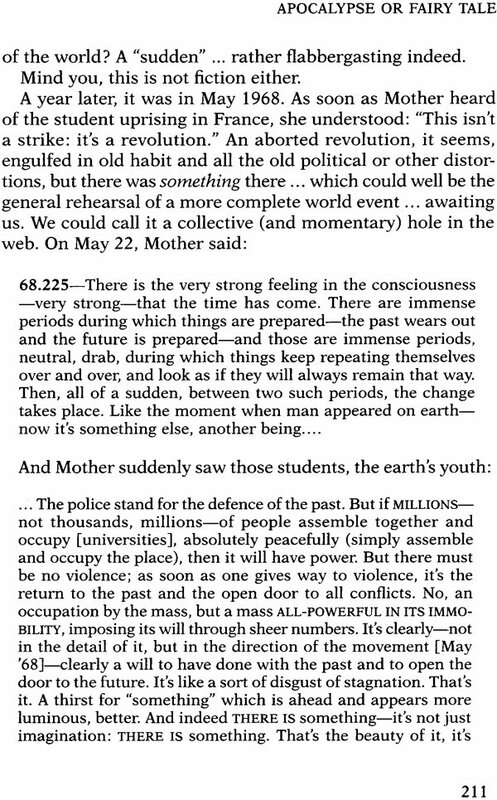 In 1989, after seven years spent "digging in the body," he wrote a brief autobiographical account, The Revolt of the Earth, in which he took stock of Man's present situation. Evolution II followed three years later, a pithy record of Satprem's journey through our human and terrestrial grave: "After Man, who? But the question is: After Man, how?" In 1994, Satprem published Lettres d'un Insoumis, two volumes of autobiographical correspondence. The next year, he wrote The Tragedy of the Earth - From Sophocles to Sri Aurobindo, which draws a curve from the Vedic and pre-Socratic era to our Iron Age and to Sri Aurobindo. La Clef des Contes appeared in 1998, followed by La Legende de l'Avenir (2000), Memoires d'un Patagonien and The Philosophy of Love (2007). In 1999, Satprem also started publishing his multi-volume Notebooks of an Apocalypse, the record of his work in the depths of the body consciousness, in which he was brutally plunged after Mother's departure in 1973. L'Oiseau Doel (1999) was published in 2008. We set forth from the Galapagos archipelago, where, around 1835, Darwin first conceived his theory of evolution: iguanas are not forever iguanas ... nor is man forever a man. We have never been told anything more serious since then-nor more captivating, or let us say more liberating, for it really is a question of finding a way out of captivity. 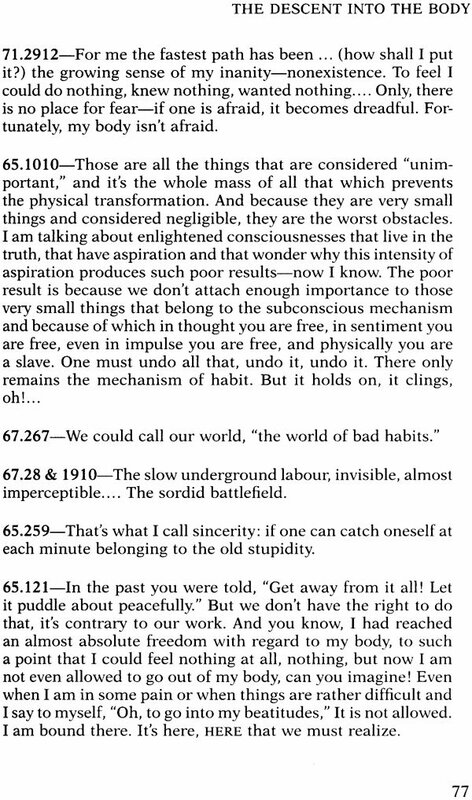 And where is the way out, apart from the explosion of the planet or heavenly, yogic or other salvations which, as we are beginning to see, leave the planet unchanged? "Salvation is physical," said she whose adventure in the consciousness of the cells I will narrate. Evolution is materialistic, as it should be, or material in any case. What remains to be seen is, what is this Matter? Closed or open? Darwin opened it, as did his contemporary Jules Verne. Max Planck, Heisenberg and Einstein opened it, as did their impressionist, fauvist or pointillist friends-Matter burst forth on all sides. 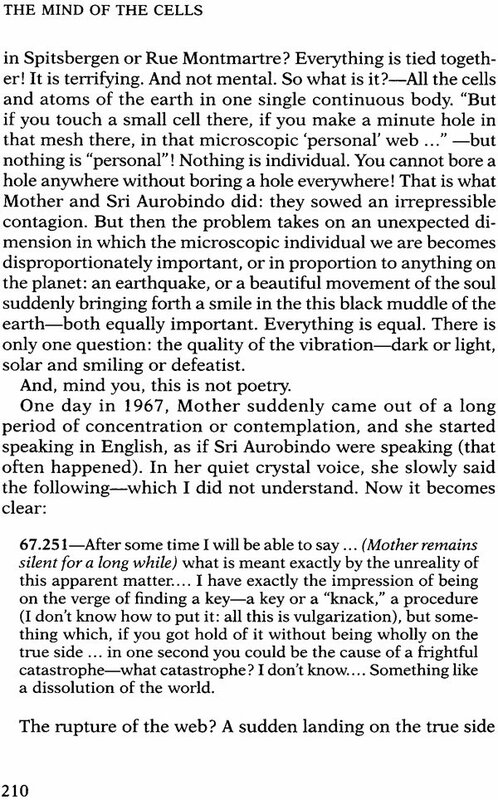 Sri Aurobindo and Mother belong to that side. Some astrophysicists too. And why should it be closed with the biologists? Ever since Darwin we have been told something very serious too, but when this "serious" begins to resemble a prison, we become wary. For the prodigious evolutionary picture since the explosion of the vertebrates, some four hundred million years ago, has oddly leaped from one biology to the next, with some crab, rabbit or orang-utan philosophies on the way. How it leaps is what interests us. Now, in 1953, a team of Anglo-American biophysicists discovered the replicating mechanism of the DNA molecule. This is serious, indeed. The order in the chain of amino acids determines forever whether we will give birth to a mouse or a man, and a certain magical and perfectly scientific molecule called deoxyribonucleic acid or DNA determines imperturbably this assembling from father to son, unless some X-rays or cosmic rays (or a little bomb) come along and collide with the chain, causing it to derail at some point ... and more likely lead us toward a monstrosity than toward a new species. Even then, all this extends over thousands and thousands of years of imperceptible mutation which might end up, with some luck, releasing some mechanism and sending us headlong at last into another species ... if the bomb leaves us the time and if, in the meantime, the four and half billion Homo sapiens on this planet have not bred so many more billions of rat sapiens and devoured the earth. That is to be seen too, for it took thousands of years, after all, to reach the first billion in 1830, whereas a hundred years were enough to reach the second billion, thirty years for the third billion, and only fourteen for the fourth billion! The problem is urgent. We no longer have thousands of evolutionary years to solve it; perhaps not even ten years. So, despite the Anglo-American team and replicating cells, where is the way out? 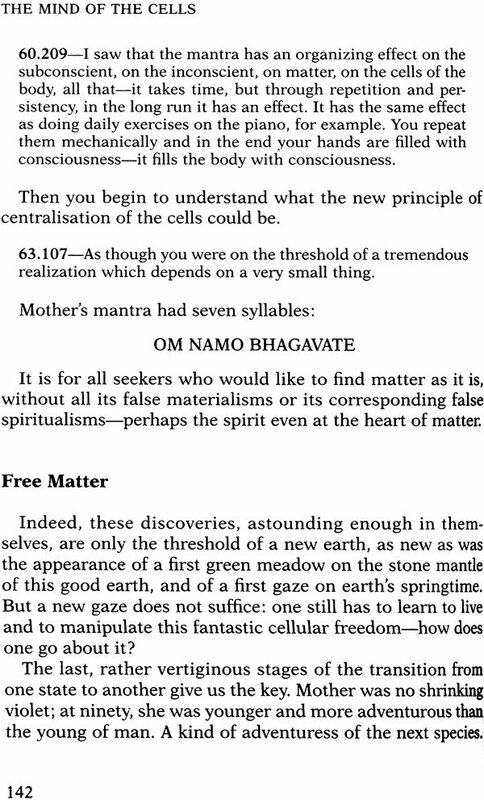 Is there a solution in the cell and in Matter, if this solution is not in heaven or in yogic liberations? 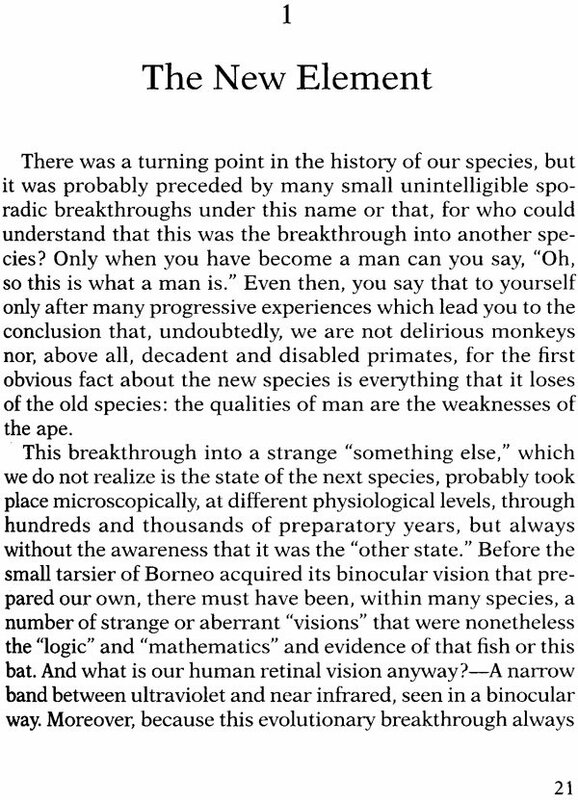 But there is no doubt that man will not remain a man indefinitely, not even an "improved" man, just as the reptile did not remain a reptile in the dried-out swamps of the Mesozoic-if we do not find the "trick," evolution will find it for us, biologists notwithstanding. Seventy million years ago, the saurians suddenly disappeared from the earth they were suffocating, leaving arboreal mice and shrews to frolic and gambol about. 57.412-"Can we hope that this body, at present our means of terrestrial manifestation, will have the possibility of transforming itself progressively into something which will be able to express a higher life, or will it be necessary to abandon this form totally to enter another which does not yet exist on earth?" 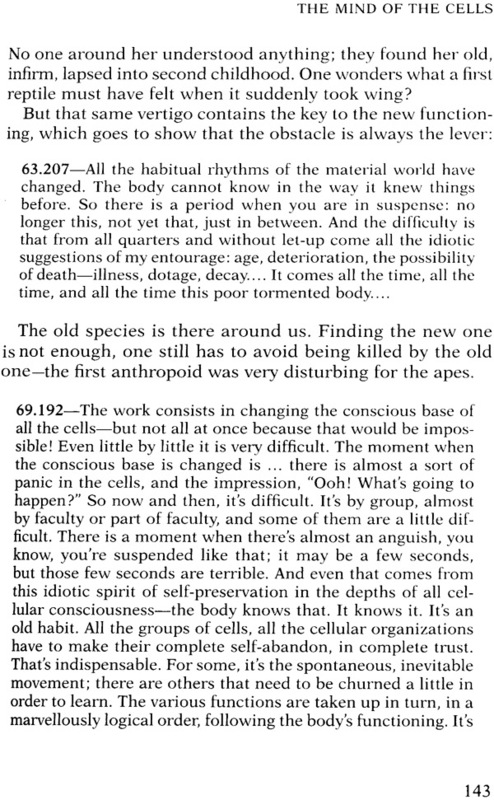 asked Mother, who was in fact going to look for the "trick" of the species in the cells of the body. "Will there be a continuity or will there be a sudden appearance of something new?.. Will the human species be like certain species which have disappeared from the earth?" It took Darwin more than twenty years to dare to express what he had sensed in the Galapagos archipelago. The Origin of Species dates back to 1859. Even so, he said, "It is some-what like confessing a murder." I am before Mother's story rather like Darwin before his iguanas. "Come now, is it possible?" And what will the biologists say, and medical science, and... ? Yet there is no doubt. For nineteen years, without quite understanding what it all meant, I listened to Mother, Sri Aurobindo's continuator, describing her experiences. Then, one day in 1973, at the age of ninety-five, she left, leaving me stunned in front of a mountain of documents filled with meaning and incomprehensible at the same time. For seven years I grappled with those documents, fought with them, banged my fist against the wall and called Mother from the other side of that "idiotic death," as she called it, for her to reveal her secret-which was there, nonetheless, completely revealed in those thousands of pages of documents, the Agenda. But what does a mouse's experience mean to a dinosaur? Yet it is full of meaning, there it is, but a slight triggering is required to put all the pieces of the puzzle into place. I even wrote three volumes in an attempt to grasp the thread, to map out the path in that incomprehensible tomorrow of man. Oh, how I battled. Some-times, I was even like Conan Doyle's Sherlock Holmes, with my magnifying glass and mental reasoning trying to grasp what is no longer mental. Mother is an impossibly fascinating detective story of the next species-how is a new species made, from where does it come, from which side, what is the mechanism? And then, one day, it was obvious-but there is nothing more invisible than the obvious, we see nothing because it is right under our noses. Can mice see anything in a man? Or even a monkey? It must think we no longer climb trees very well, and then what? So I looked and looked at Mother's story, and then? 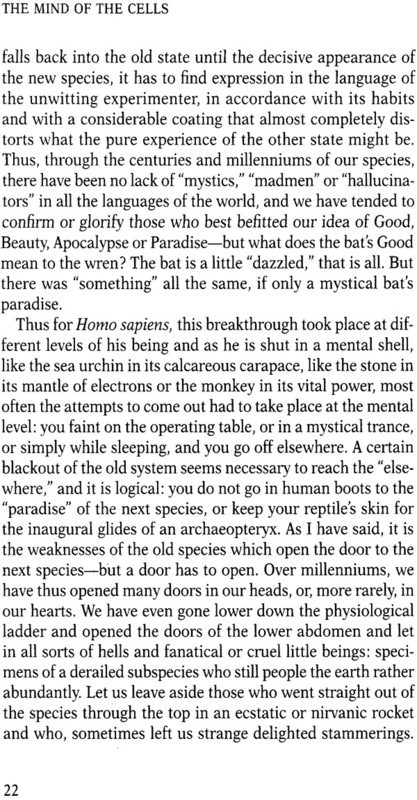 Then my eyes widened and, yes, it is rather like Darwin's "confessing a murder." I do understand what he meant. It is such a challenge to our species and to the laws of our species, and yet it is logical and natural-but go and tell the Borneo shrew that Homo sapiens is natural and logical! I see only one way to lead the reader into this detective-biology of the next species: it is to state Mother's decisive experiences bluntly, without embellishments or comments, by numbering them like laboratory experiments, and then, around these kernels of experience, to draw the lines that have led there and those that lead from there to a new kernel of experience, until the puzzle is complete and the conclusion inevitable.